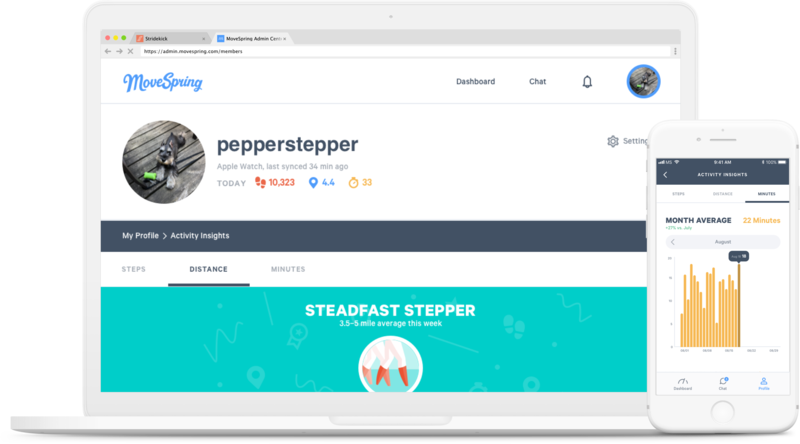 Introducing our new Activity Insights feature, now available in your profile. View your weekly, monthly and yearly averages for steps, distance and minutes. You can also see your all-time best days for steps, distance and active minutes. Unlock one of seven activity levels based on your weekly activity average. Your weekly average is based on your daily activity average Monday through Sunday. Each week resets on Monday, so you always have a chance to reach Superstar status. Get a better idea of your trends over time by checking out your month or year averages. All averages are calculated from the beginning of the week, month, or year up to the present date. For example, on the first day of the week, your week average will be your total steps for that day, not your total steps divided by seven days. On Tuesday, your week average will reflect Monday + Tuesday divided by two. To view the Insights feature, you’ll need to navigate to your profile section in the MoveSpring mobile app or website. To access your profile, click the profile icon in the bottom navigation bar of your MoveSpring app. On web, click your profile picture and select your username in the dropdown. Once on your profile, scroll down to view your Activity Insights cards. Swipe the card to view stats on each metric. Tap on the card to view graphs, charts and more detail. Allow others to view your Activity Insights by setting your profile to Public. You can see other participant’s Activity Insights if they also have a public profile. Tap on another person’s username to be taken to their profile where you can see their Activity Insights, all the ways they like to get active, as well as their current challenge groups. Please reach out to our support team for additional assistance. MoveSpring support is available from 9 AM to 5 PM (CST), Monday–Friday.